A year later, while Pandora’s business has experienced tremendous growth, it’s fair to say that their social feeds haven’t. 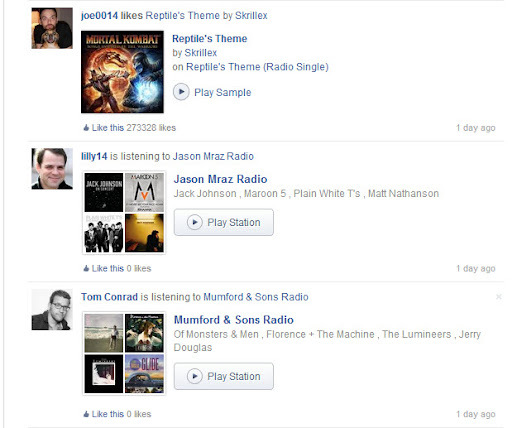 How many times do you think to use social discovery on Pandora? Or encounter a link to Pandora via a 3rd party service? What’s at the core of these challenges – does Pandora “not get social?” (oh how i hate that phrase) The problem isn’t in their DNA but rather their business arrangements. As a service which relies upon compulsory license agreements, they can’t play songs on demand, but rather abide by a set of rules governing digital radio services. In exchange they don’t need to negotiate agreements with the record labels and instead pay a flat fee per song. But this same bind prevents them from creating a great social service. Why? Because songs are the unit of sharing for music. Not stations. And if you try to share a song on Pandora all others can do is listen to a sample of it. A small, not satisfying sample. And so, people don’t share. Instead Pandora must rely upon being broadly distributed (access) and creating great single-user experiences (personalization). You want to share a song? Fine, go to YouTube or Spotify. But you want to listen to an hour of great tunes without having to do anything but press play? That’s Pandora. And it’s working – Pandora gets the strong majority of my “time to tune out” listening time. But that’s when I’ve already decided that I’m going to listen to music. If I’m just surfing around, I more often come across single songs shared via competing services and those potentially pull me away from Pandora. The more casual user has no opportunity to be pulled into Pandora via any site/app other than Pandora. 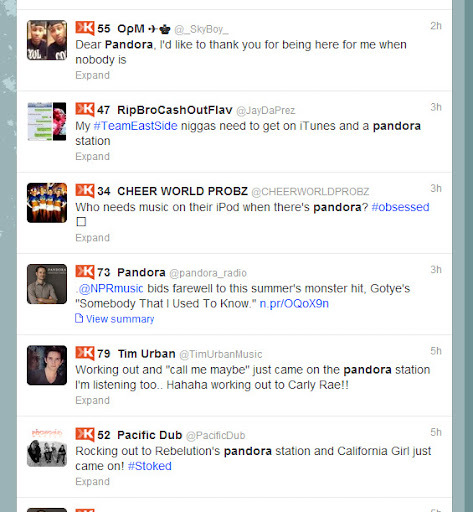 For example, look at “pandora” vs “spotfiy” on Twitter. People are huge evangelists for Pandora but no links. 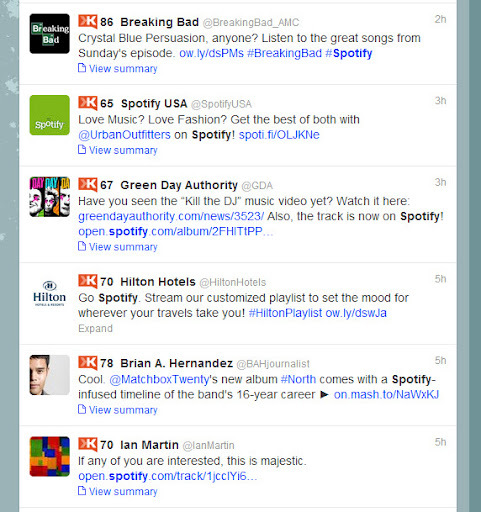 Spotify on the other hand not only has users, but also brands, promoting its service with links to songs and playlists. Does Pandora management think this is an issue? Probably, but not one they want to take on right now. They could negotiate with the record labels to allow for limited on-demand streaming, which would enable me to share an individual song from my Pandora station and play it back once for friends who click on it (after which of course Pandora would use that song as a seed for shifting seamlessly into personalized radio for them — get ’em with a song, hook em’ w an experience). However that would require starting to negotiate with the labels and putting the renewal of compulsory licenses at risk a few years down the road. This door may need to be opened regardless if Pandora ever wants to launch in countries which lack internet radio licenses, but as we’ve seen with their Australia launch, they don’t seem to be in any rush to try out new models. And why should they? With last quarter’s growth exceeding expectations and smart homes/smart cars/smart phones rolling out, they’ve got plenty of positive momentum. But outside of the opaque blackbox tuning that’s Pandora’s secret sauce, I don’t spend as much time thinking about my music there – that’s actually one of their strategies. On Spotify however I’m creating and subscribing to playlists. Checking out what songs my friends are listening to. It’s more work and right now it doesn’t steal from my Pandora time (I pay for both services), but it’s certainly an alternative approach to music which is either complementary or competitive depending on your POV. So at the end of the day Pandora may actually never be social, finding themselves in a small group of successful products which can ignore the Like button, but with a sharing flank exposed to their competitors.